What would happen if all the lies suddenly disappeared? For starters, 99% percent of the internet would be gone, and the remaining 1% would just be cat videos. Government heads could no longer fudge their approval ratings; the media would have to be far more discerning about who they call a “troubled loner” and who they call a “terrorist;” companies would lose the ability to act like your personal friend privy to all your secrets. Social media sites would immediately lose their appeal, because suddenly you’d have to tell the world how your life really is. If all the lies were removed from the world, it would become much easier for you to tell which of the stories in this issue are non-fiction, because they’d be the only ones remaining. But even then, they might be changed. Even the most honest writers might find holes appearing in their ‘true’ story. In reality, we’d all lose the ability to speak or write more than the simplest sentences. This is because even the truest recollections have a dash of embellishment. The second you try to put a moment into words, you’ve changed it. 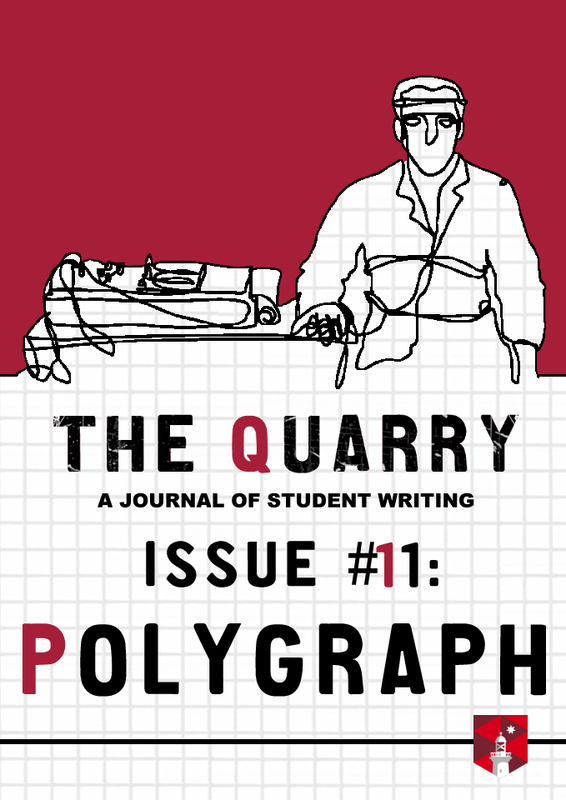 On that note, it is with great pleasure that I welcome you to ‘Polygraph,’ the eleventh issue of Macquarie University’s creative writing journal The Quarry. This edition was done a little differently from its predecessors: contributions to the journal usually come from a specific cohort of either undergraduate or postgraduate writing students. For Issue #11, we are instead showcasing works by both past and present undergraduate and postgraduate students from our creative writing programs. This edition’s theme, ‘Polygraph,’ has also been given a unique approach. Like the polygraph test of its namesake, this issue challenges you to separate the truth from the ‘lie’ of fiction. It may take some literary detective work before you’re satisfied with your reading, and every time you re-read these stories, the needle of your personal polygraph may shift. Flash prose is an ideal form for capturing only the most salient impressions of a moment, leaving just enough ‘gaps’ to keep things intriguing for the reader. To make your job easier (or perhaps harder), we have added a comments feature to each contribution. One story might leave you convinced that it recounts real events…until you see a comment from a fellow reader who has their own, equally convincing argument for why it can’t possibly be true. You might like to keep revisiting this issue, participating in the ongoing discussions it generates. You might find that between all of you, you are finally able to come to a consensus. You might also discover that some stories will always elude classification. Many thanks to my editorial team, Mary Raposa, Hannah Baker, Lucy Ross and Helen Steinberg, and to our 33 contributors. Without you, this issue wouldn’t have been possible. For everyone who submitted a story: thank you for sharing your imagination and experiences. This small selection is a testament to the high calibre of writing that the creative writing students and alumni have to offer.